Charles Paillard, Bin Xu, Brahim Dkhil, Gregory Geneste and L. Bellaiche, Physical Review Letters 116, 247401 (2016). Dependence of various properties on the ne concentration of electrons excited in the conduction band states for the direct VBM (blue lines and data), the indirect VBM-CBM (red lines and data), and the direct CBM cases (green line and data), as predicted by the ΔSCF method. Panel (a) shows the relative change in pseudocubic lattice constant. Panel (b) reports the change in pseudocubic angle for the three transitions. Panel (c) shows the relative change in lattice constant along the [11–0] direction. Panel (d) shows the change of electrical polarization. Lines in all the panels are linear fits of the data (indicated by symbols). The open symbols and dashed lines in (a) display the estimated change of lattice constant arising from the inverse piezoelectric effect (see text). Grègory Geneste, L. Bellaiche and Jean-Michel Kiat, Physical Review Letters 116, 247601 (2016). 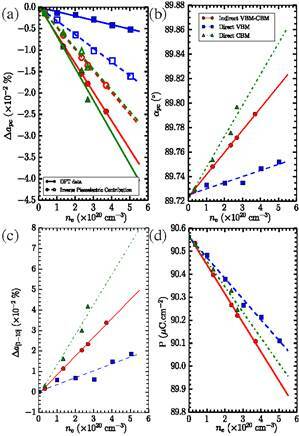 Upper panels: (a) local free-energy barriers ΔFloc(T;x) (eV) and (b) hopping times τ(T;x)=τ0e+ΔFloc(T;x)/kBT (s) as a function of temperature for the three Ti-richest blocks (x=1, x=0.875, and x=0.75). Lower panels: temperature evolution of χ′ and χ‘‘. (c) Dielectric susceptibility: real part. (d) Dielectric susceptibility: imaginary part. In panel (c), the lines correspond to a fit according to Ref. . In panel (d), the lines are guides for the eyes. (a) Magnetic ordering transition temperatures for the set of superlattices. The results are ordered according to the ratio n/m for each (BFO)m:(BMO)n SL with m:n shown in the panel. (b) Computed magnetization at three different temperatures, for the same superlattices as shown in (a). 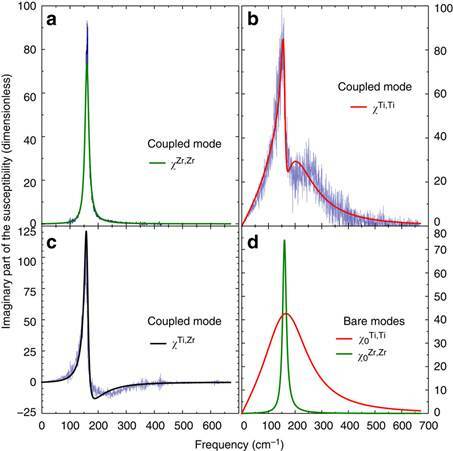 The horizontal dashed line in (a) and (b) shows the Curie temperature of pure BMO bulk and the magnetization of BFO thin film, respectively, for comparison. Sergey Prosandeev, Andrei Malashevich, Igor P. Raevski, L. Bellaiche, Physical Review B, Rapid Communications 91, 100101(R) (2015). Time-dependency of the electric polarization (a), electric toroidal moment (b), time derivative of the electric toroidal moment (c), and (minus) the product of the macroscopic polarization and its time derivative (d) in the studied PZT film being under the ac electric field described in the text. Solid vertical lines mark the position of the extrema of the polarization (which coincide with those of the electric field), while dashed lines correspond to the time associated with the pulses in the time-derivative of the electrical toroidal moment. In Panels (a) and (b), the dot symbols represent the MD data, while the solid lines are fittings of such data. These fittings are then used to obtain the curves shown in Panels (c) and (d). A. Al-Barakaty, Sergey Prosandeev, Dawei Wang, B. Dkhil and L. Bellaiche, Physical Review B 91, 214117 (2015). 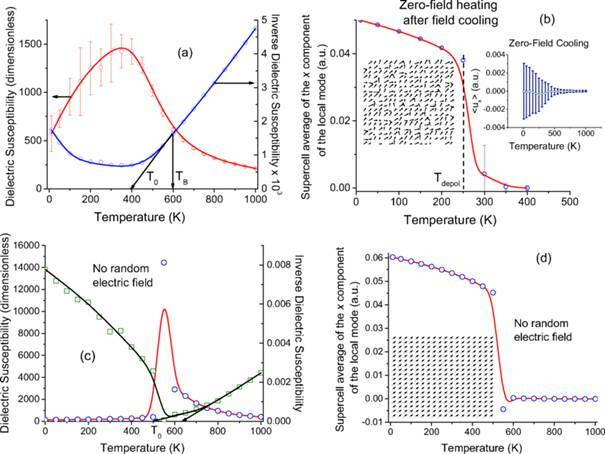 Temperature dependence of the dielectric susceptibility and its inverse, when cooling down the disordered PbMg1/3Nb2/3O3system under no electric field. TB and T0 correspond to the Burns temperature and the temperature extrapolated from the Curie-Weiss law at high temperatures, respectively. The inset shows the x-component of <u>, when the system is cooled under no field. The error bars are those arising from computing averages over 30 different chemical configurations. Zhigang Gui, Lin-Wang Wang and L. Bellaiche, Nano Letters 15, 3224 (2015). Schematization of the band alignment for the PT-PE phase at 425 K (Panel a) and for the FT−PE phase at 165 K (Panel b), respectively. Changsong Xu, Bin Xu, Yurong Yang, Huafeng Dong, A. R. Oganov, Shanying Wang, Wenhui Duan, Binglin Gu, and L.
Bellaiche, Physical Review B, Rapid Communications 91, 020101(R) (2015). 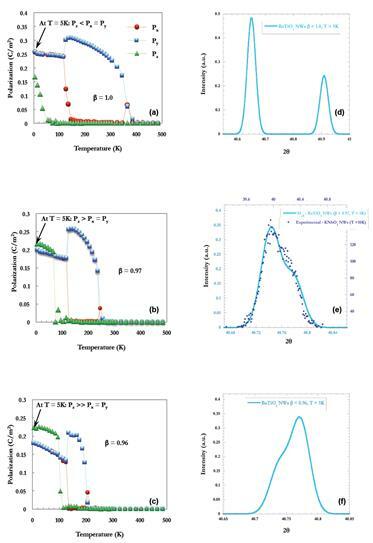 Pressure dependence of the enthalpy of the Pv-Pnma, pPv-Cmcm, and ppPv-Pnma phases of NaMgF3 (a), along with the schematization of (b) the Pv-Pnma, (c) pPv-Cmcm, and [(d) and (e)] ppPv-Pnma crystal structures. Note that the enthalpy of the Pv-Pnma phase has been set to be zero for any pressure in (a), and that the inset in (a) displays the behavior of the volume vs pressure in the Pv-Pnma, pPv-Cmcm, and ppPv-Pnma phases (in the pressure ranges they have the lowest enthalpy). Y. Nahas, S. Prokhorenko, L. Louis, Z. Gui, I. Kornev and L. Bellaiche, Nature Communications 6, 8542 (2015). Stability of the skyrmionic state. (a) Polarization field configuration within the relaxed skyrmionic state (Sk) as obtained from the simulation at 15 K. (b) Local dipoles plotted along a line passing through the skyrmions core and parallel to the x coordinate axis. It is seen that the tips of the dipoles describe a circle in the plane perpendicular to the line, thus indicating the variation of the y and z components along this line. The vectors are coloured according to their z-component in a,b. (c) Dependence of the internal energy de on the Pz component of polarization showing the crossover between two stable minima: the one corresponding to the (Vxy|FEz) state characterized by a vortex pattern in the z-planes co-occurring with an electrical polarization along the  direction, and the one associated with the skyrmionic texture (Sk). Error bars indicate s.d. (d) Temperature dependence of the estimated threshold external electric field E* needed to drive the system towards the skyrmion state. 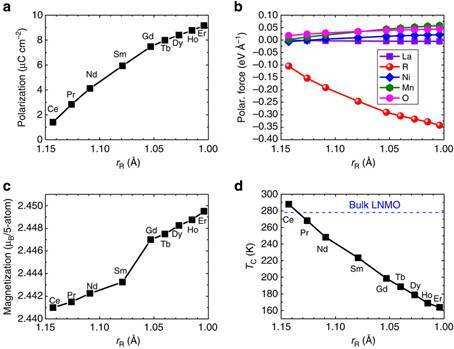 Bin Xu, Dawei Wang, Hong Jian Zhao, Jorge Íñiguez, Xiang Ming Chen and Laurent Bellaiche, Advanced Functional Materials, DOI: 10.1002/adfm.201501113 (2015). Figure 4. The five-state switching mechanism for (BiFeO3)1 /(NdFeO3)1 superlattice. 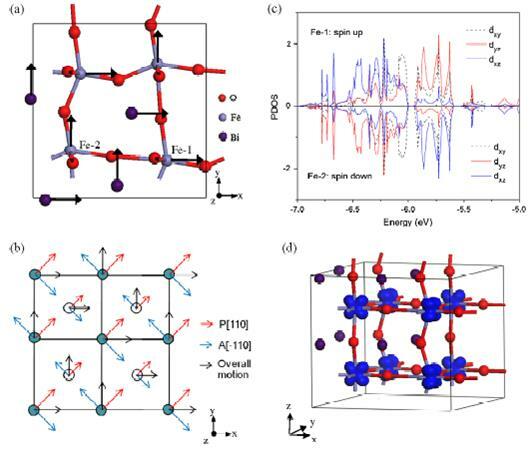 a,b) The local modes (upper panel: u_Γ ; lower panel: u_x characterizing ferroelectricity and antiferroelectricity, respectively); c) oxygen octahedra tilting vectors (ω_R and ω_M characterizing anti-phase and in-phase tiltings, respectively); d) the AFM vector; and e) the weak FM vector under a sequence of applied electric fields, i.e., 1) an increasing field along the  direction (perpendicular to the initial polarization); 2) field removed; 3) an increasing field along the  direction (antiparallel to the initial polarization); 4) field removed. The insets show schematics of the five-state switching mechanism. D. Wang, J. Hlinka, A. A. Bokov, Z.-G. Ye, P. Ondrejkovic, J. Petzelt and L. Bellaiche, Nature Communications, DOI: 10.1038/ncomms6100 (2014). (a–c) The dielectric responses from Zr cells, χZr,Zr, from Ti cells, χTi,Ti, and from the cross-correlation between Ti and Zr cells, χTi,Zr, which include the coupling between the bare responses of Ti and Zr sublattices. (d) The bare dielectric response from Zr cells, χ0Zr,Zr and bare dielectric response from Ti cells, χ0Ti,Ti. The actual MD data are also shown (in blue colour) in order to confirm that Fano interference leads to the main striking features adopted by χTi,Ti and χTi,Zr. The parameters entering this interference are found by simultaneously fitting the MD data of χTi,Ti and χZr,Zr using and . Hong Jian Zhao, Wei Ren, Yurong Yang, Jorge Iniguez, Xiang Ming Chen and L. Bellaiche, Nature Communications 5, 4021 (2014). 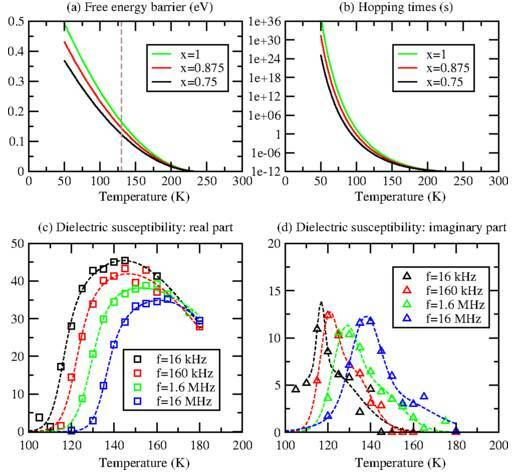 (a,c,d) The predicted electric polarization (as computed from Berry phase), magnetization (at T=0 K) and paramagnetic-to-ferromagnetic transition temperature (as calculated by Monte Carlo simulation) in the relaxed P21 ground state of the superlattices, respectively. (b) The average forces (along the b direction) on La3+, R3+, Ni2+, Mn4+ and O2− ions in the unrelaxed state of the R2NiMnO6/La2NiMnO6 superlattice, for which the lattice parameters and atomic coordinates are those of the paraelectric P21/n state of La2NiMnO6 and for which the R ions occupy the second AO layer of Fig. 1a. The blue horizontal dashed line in d represents the magnetic Curie temperature of La2NiMnO6 bulk. As evidenced in Supplementary Fig. 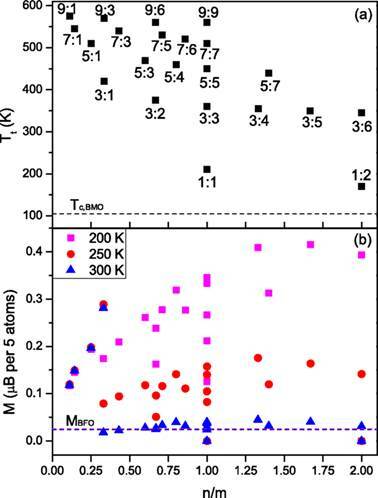 2, the error bar of the paramagnetic-to-ferromagnetic transition temperature can be estimated to be about 6 K. Moreover, an error bar of polarization can be estimated by comparing the results of the relaxed structure of the Er2NiMnO6/La2NiMnO6 superlattice when using U=3 eV and U=5 eV. It is found to be as small as 1% (which corresponds to a variation of the polarization from 9.16 to 9.26 μC cm−2). Satadeep Bhattacharjee, Dovran Rahmedov, Dawei Wang, Jorge Iniguez and L. Bellaiche, Physical Review Letters 112, 147601(2014). 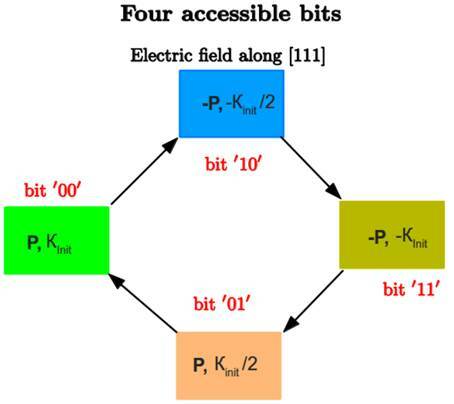 Schematization of the proposed four-state memory. S. Prosandeev, Dawei Wang and L. Bellaiche, Physical Review Letters 111, 247602 (2013). Dependency of the critical temperatures on misfit strain, in epitaxial BZT films (as averaged over 20 different realizations of disorder). The open circles, triangles, and squares are numerical data for Tb, Tm,IP, and Tm,z, respectively, while solid lines are guides for the eyes. The vertical dashed lines delimit the regions I, II, and III indicated in the text. The error bars on the numerical data are estimated to be around 50 K. The Tb temperatures associated with a single atomic configuration (which is chosen among the studied 20 realizations of disorder), is also shown by filled circles and a dashed line, to emphasize the effect of atomic distribution on physical properties of BZT systems and the need to average over different configurations to model complex disordered material. Yurong Yang, Jorge Iniguez, Ai-Jie Mao and L. Bellaiche, Physical Review Letters 112, 057202 (2014). Schematization of properties in the equilibrium (P, A, ω) state (left panels) and (−P, A, −ω) phase (right panels). The upper panels display the zigzag motions of Bi atoms in an (x, y) plane. The middle panels show(i) oxygen octahedral tiltings (represented by curled arrows), (ii) magnetic dipoles associated with the weak A-type antiferromagnetic vector (purple arrows) and with the predominant G-type AFM vector (represented by green arrows), and (iii) Bi displacements that are associated with AFE (light blue arrows). The lettering “Fe” (respectively, “Bi”) indicates the iron (respectively, bismuth) ion whose location serves as the origin for the definition of the ω, G, and AAFM (respectively, A) vectors. The lower panels schematize the directions of P, the AFE vector, the AFD vector, the G-type AFM vector, and the weak A-type AFM vector. L. Bellaiche and Jorge Iniguez, Physical Review B 88, 014104 (2013). Schematic representation of two simple AFD patterns, indicating with arrows the displacements affecting the oxygen atoms. The oxygens that get closest to the central A cation are marked with asterisks; in (b), there are two symmetry-inequivalent cases, marked with single and double asterisks, respectively. Schematic of the quantities involved in the derivation of the formula associated with the spin-current mode. S. Prosandeev, Dawei Wang, A. R. Akbarzadeh, B. Dkhil, and L. Bellaiche, Physical Review. Letters. 110, 207601 (2013). Snapshots of the dipolar configurations in a given (y, z) plane for different electric fields applied along  in disorderedBaeZr0:5Ti0:5 TO3 solid solutions, at 10 K. Panels (a), (b), (c), (d), (e), and (f ) correspond to the field’s magnitude of 0 V=m (region I), 3×107 V=m (regions I/II), 8×107 V=m (region II), 1.2×108 V=m (region III), 1.7×108 V=m (regions III/IV), and 2.0×108 V=m (region IV), respectively. Green color (small arrows) indicates that the local modes are centered on Zr ions. Blue and black colors (large arrows) indicate that the local modes are centered on Ti ions, and that the corresponding x component of these local modes are negative and positive, respectively. Red color (solid line) is used to delimit PNRs. The clusters appearing in panel (a) are denoted by numbers varying between 1 and 8. D. Sando, A. Agbelele, D. Rahmedov, J. Liu, P. Rovillain, C. Toulouse, I. C. Infante, A. P. Pyatakov, S. Fusil, E. Jacquet, C. Carrétéro, C. Deranlot, S. Lisenkov, D.Wang, J-M. Le Breton, M. Cazayous, A. Sacuto, J. Juraszek, A. K. Zvezdin, L. Bellaiche, B. Dkhil, A. Barthélémy1 and M. Bibes, Nature Materials 12, 641–646(2013). The energy of three magnetic states (bulk-like ‘type-1’ cycloid with propagation vector along [1-10] directions, ‘type-2’ cycloid with propagation vector along (110)directions, and collinear antiferromagnetic order with antiferromagnetic vector close to ), relative to a fourth magnetic state, corresponding to a collinear antiferromagnetic order with antiferromagnetic vector along in-plane [1-10] directions. The stability regions of the different states are shown in colours (blue: antiferromagnetic; red: type-1 cycloid; orange: type-2 cycloid). The different substrates used are located on top of the diagram at their corresponding strain. Their colour corresponds to the magnetic state determined from the Mössbauer measurements. The sketches represent the different magnetic states, with spins shown in green. Wei Ren, Yurong Yang, Oswaldo Dieguez, Jorge Iniguez, Narayani Choudhury, and L. Bellaiche, Physical Review Letters110, 187601 (2013). 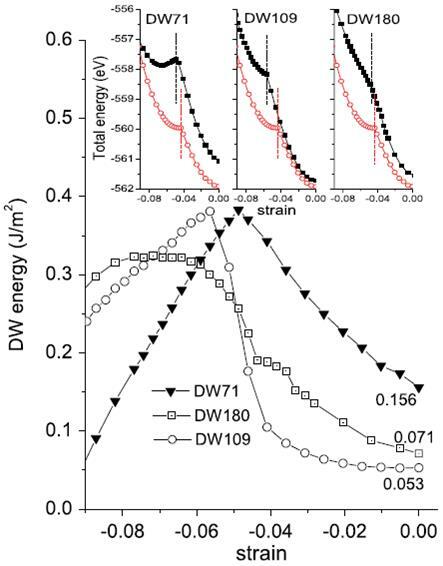 Dependence of domain wall energies on the in-plane epitaxial strain for the investigated multidomain structures. The insets show the minimum total energy of the MD structures (in solid black squares) and SD configurations (via open red circles) as a function of the misfit strain. In these insets, the vertical dashed lines delimit the strain regions for which the MD structures adopt an R-like phase while the SD configuration has already transformed into its T phase. Sergey Prosandeev, Andrei Malashevich, Zhigang Gui, Lydie Louis, Raymond Walter, Ivo Souza, and L. Bellaiche, Physical Review B 87, 195111 (2013). Predicted hysteresis loops in the studied nanocomposite at 15 K for a frequency of 1 GHz. Panels (a) and (b) showthe electrical toroidal moment and polarization, respectively, as a function of the value of the ac electric field. Yurong Yang, Wei Ren, Dawei Wang, L. Bellaiche, Phys. Rev. Lett. 109, 267602 (2012). Predicted total energy of theG-typeAFM state [panel (a)] and energy difference between the G-type AFM andFMstates [panel (b)] versus the misfit strain for low-in-energy phases in epitaxial (001) ETOfilms. The inset of panel (a) displays a schematic of the a_a_cm-type nanoscale twinned phases possessing the mmmppp tilting pattern. In this inset, the curled and straight arrows represent oxygen octahedra tilting about  or [00_1] and antiferroelectric Eu displacements, respectively. The different tilting angles about  are also provided here. Yurong Yang, Massimiliano Stengel, Wei Ren, X. H. Yan and L. Bellaiche, Physical Review B 86, 144114 (2012). 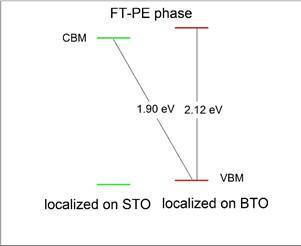 Predicted local properties of epitaxial (001) [PTO]3/[BFO]3 superlattice versus the in-plane lattice parameter in the equilibrium phases. (a) and (b) Show the x component (which is identical to its y component) of the local effective polarization and the z component of the local formal polarization in the six cells. Panels (c) and (d) display the x component (which is identical to its y component) and the z component of the cell-by-cell decomposition of the AAFD vector in the six cells , respectively. The inset of (d) represents the in-phase octahedra tilting in the six cells, the effective polarizations of BFO and PTO cells are shown by means of vertical arrows. S. Prosandeev, Dawei Wang, Wei Ren, Jorge Iniguez and Laurent Bellaiche, Advanced Functional Materials (2012); DOI: 10.1002/adfm.201201467. 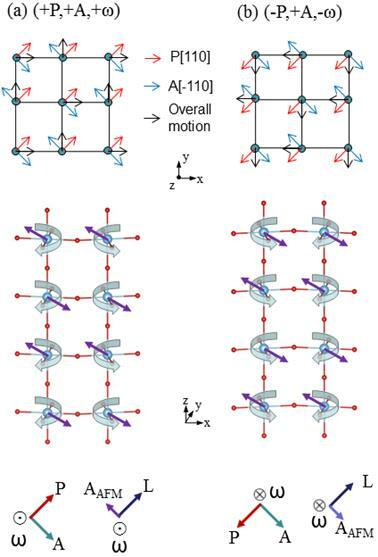 Schematic of the nanoscale twinned octahedral tilting structures found by first-principle calculations. a,b) The ppmppm and ppmm patterns, respectively. The straight arrowsrepresent the antiferroelectric Bi displacements (that are oriented along the  or [-1-10] pseudo-cubic directions), while the curled arrows indicate if the displayed oxygen octahedraltilting is counterclockwise or clockwise. A. R. Akbarzadeh, S. Prosandeev, Eric J. Walter, A. Al-Barakaty and L. Bellaiche, Physical Review Letters 108, 257601 (2012). Snapshots of the dipolar configurations in a given (y, z) plane for different temperatures. Panels (a), (b), (c), (d), (e), and (f ) correspond to temperatures of 550 K (Region I), 250 K (Region II), 150 K (Region III), 100 K (Region IV), 50 K (Region IV) and 10 K (Region IV), respectively. Blue colors and red colors indicate that the corresponding local modes are centered on Ti and Zr ions, respectively. Yurong Yang, Wei Ren, Massimiliano Stengel, X. H. Yan and L. Bellaiche, Physical Review Letters 109, 057602 (2012). Features of the Pmc21 state of BFO. Panel (a) displays atomic characteristics and emphasizes the inhomogeneous in-plane displacements of the cations. Panel (b) schematizes these displacements in terms of the sum of a polar and antiferrolectric distortion. Panel (c) shows the partial density of states related to the dxy, dyz, and dxz orbitals of two Fe ions belonging to the same (001) layer. Panel (d) shows the C-type ordering between the dyz and dxz orbitals of Fe ions in the BFO films. In panel (b), the Bi (respectively, Fe) atoms are indicated by filled (respectively, open) circles, and the Bi and Fe atoms belong to different (001) planes. [also selected for inclusion in IOP Select]. Ferromagnetic (F) and antiferromagnetic (G, C and A) vectors for different oxygen octahedra tilting arrangements and different resulting paraelectric phases in BiFeO3 bulks, as predicted by first principles. The chosen ωR and ωM AFD vectors are provided in the first two columns. The asterisk indicates the primary magnetic vector. Each different case is referred to by an integer that is indicated at the beginning of each row. The magnetic vectors are expressed in units of Bohr magneton per Fe ion. The AFD vectors are indicated in radians. Glazer notations are used to describe the tilting arrangements of the oxygen octahedra. Features of the different phases found in the studied nanocomposite for different temperature regions. Panels (a)–(d) show dipolar patterns that are characteristics of Phases I, II, III and IV, respectively (see text). In each panel, the left part shows the pattern adopted by the x- and y-components of the dipoles in the (001) plane indexed by z = 6, while the top (respectively, bottom) right part displays the configuration for the x- and z-components (respectively, y- and z-components) of the dipoles in the (010) plane indexed by y = 27 (respectively, (100) plane indexed by x = 27). In the left parts, the wires boundaries are indicated by black dashed lines and the vortices within those wires are indicated by red dots, while the vortices and antivortices of the medium are highlighted by blue dots and green crosses respectively. In the right part of Panel (a), zigzag chains are emphasized via dashed lines. Panel (e) schematizes the dipolar pattern of Phase I and provides the decomposition of its total (zero) winding number. Panel (f) represents the motion of the vortex core in one wire (namely, the one shown in the bottom right part of the left side of Panel (a)) at T = 5 K. The rotating in-plane polarization is also shown there. The magnitude of this rotating in-plane polarization is about one order smaller than the homogeneous out-of-plane polarization. Dawei Wang, Jeevaka Weerasinghe and L. Bellaiche, Physical Review Letters 109, 067203 (2012). 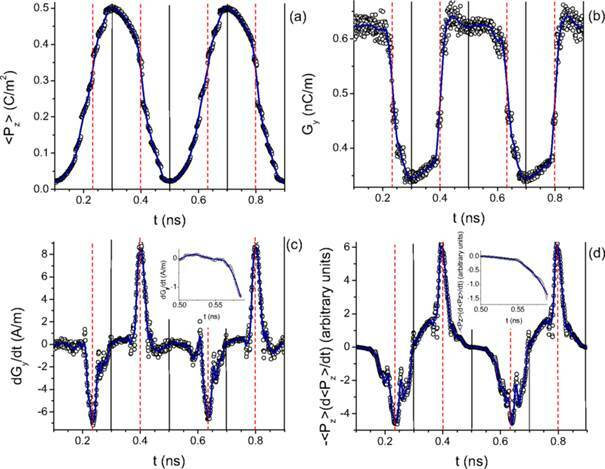 Complex electric (a) and magnetic (b) susceptibilities as a function of frequency in BFO at T = 20 K.
Dawei Wang, E. Buixaderas, Jorge Iniguez, Jeevaka Weerasinghe, Hong Wang and L. Bellaiche, Phys. Rev. Lett. 107, 175502 (2011). parts, respectively, of such complex dielectric responses. Wei Ren and L. Bellaiche, Phys. Rev. Lett. 107, 127202 (2011). Electrical toroidal moment (a), AFD related quantity ω (b), AFM vector (c), and magnetization (d) as functions of the magnitude of the S vector applied along the[-1-10] direction. S. Prosandeev, Igor A. Kornev, and L. Bellaiche, Phys. Rev. Lett. 107, 117602 (2011). Atomic features of the predicted P212121 state. Panel (a) displays the crystallographic structure. Panels (b), (c) and (d) schematize the Bi displacements associated with the projection of gM, gX and of the sum of these two latter order parameters, respectively, in a pseudocubic(010) plane.The green (respectively, blue) arrows/circles are used to emphasize a ferroelectric vortex (respectively, antivortex). A 10 K pattern of the electric dipoles (a) and AFD vectors (b) in a (y; z) plane for the aacd [Raac] state of the 4.8 nm-thick PZT ﬁlm under a compressive strain of -0.25%, as mimicked by a 12x12x12 supercell.The “cylindrical chiral bubbles” formed by the electric dipoles are highlighted by means of ovals in (a). The dipolar waves are also highlighted by means of a solid line in (a). The arrows ‘‘up’’(blue) and ‘‘down’’ (red) refer to the z component of the dipoles or AFD vectors being positive or negative, respectively. Narayani Choudhury, Laura Walizer, Sergey Lisenkov, L. Bellaiche, Nature 470, 513 (2011). Frustrated ground-state microstructure and dipolar orientational correlations in phase II. a, Ground-state dipolar configuration. Blue, positive dipole z component; red, negative dipole z component. b, Bending of lines, curvature and herringbone patterns in the microstructure are indicated by solid black lines. Selected z chains are highlighted and some ‘topological defects’ are circled. c–e, Orientational correlation functions. For the blue curves the first dipole (used to compute these correlation functions) belongs to an up z-chain, and for the red curves it belongs to a down z chain. f, Dipoles forming the herringbone pattern (black lines in b). S. Prosandeev, S. Lisenkov, and L. Bellaiche, Physical Review Letters 105, 147603 (2010). 10 K pattern of the ui local mode vectors [panel (a)] and Ωi AFD vectors [panel (b)] in a (X, Z) plane for the equilibrium 71°domains of the 8 nm-thick film. I. C. Infante, S. Lisenkov, B. Dupé, M. Bibes, S. Fusil, E. Jacquet, G. Geneste, S. Petit, A. Courtial, J. Juraszek, L. Bellaiche, A. Barthélémy, and B. Dkhil, Physical Review Letters, 105, 057601 (2010). 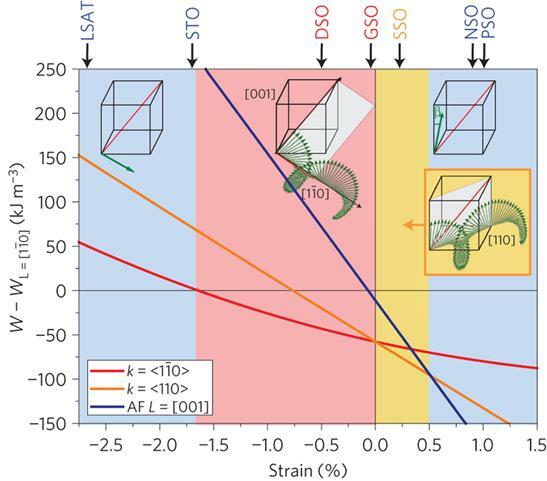 Effective Hamiltonian results evaluated in a BFO film, at 300 K and vs misfit strain, (a) tetragonality (c/a ratio), and (b) antiferrodistortive angles ω along x, y, and zaxes (ωX and ωY, red, and ωZ, blue). 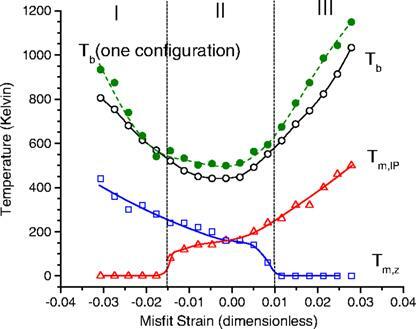 (c) Theoretical results on BFO film transition temperatures (TC, blue, and TN, green) as a function of misfit strain. The activation temperatures for the antiferrodistortive oxygen tilting along z direction (tetragonal distortion T001, black), for the antiferrodistortive oxygen tilting within thex-y plane (orthorhombic distortion T110, red), and for the tilting along [uuv] direction (monoclinic distortion Tuuv, orange) are also plotted. David Sichuga, Wei Ren, Sergey Prosandeev, and L. Bellaiche, Physical Review Letters 104, 207603 (2010). Structural patterns in a (001) plane at 10 K, for a PZT nanodot under OC conditions possessing a Ti composition of 51% and having a lateral size of 2.4 nm. (a) local dipoles. (b) antiferrodistortive motions ωi. (c) Ωi= (-1) nx(i)+ny(i)+nz(i) ωi. Panels (d), (e), and (f ) represent similar data, respectively, but for a BFO nanodot of lateral size of 4.8 nm and in a (110) plane. Such unusual collective behaviors occur for any lateral size larger than 1.6 nm. (1), (2), (3), and (4) refer to the four domains mentioned in the text, and involved in Eq. (3) via the mindex. Planes located just above or below the presented planes exhibit the same configuration for the electric dipoles and the_ivectors (reflecting the fact that the tilting of the oxygen octahedra are associated with theR point in PZT and BFO bulks). L. Louis, P. Gemeiner, I. Ponomareva, L. Bellaiche, G. Geneste, W. Ma, N. Setter, B. Dkhil, Nano Letters 10, 1177 (2010). Left: Cartesian components of the polarization Px, Py, and Pz (in C/m2) as a function of temperature in BaTiO3 with rectangular cross-section of 7.2 × 7.2 Å2(as mimicked by a 18 × 18 × 12 supercell) under (a) perfect SC, where β = 1, and partial screening (b) with β= 0.97, and (c) with β = 0.96 conditions. The infinite direction of the wire is along the z-axis. The x-, y-, and z-axes are chosen along the pseudocubic , , and  directions respectively. Right: Calculated XRD (200) Bragg peaks for BaTiO3 nanowires at 5K under (d) perfect SC, for which β = 1, and partial screening with (e) β = 0.97, and with (f) β = 0.96. The solid lines show such predicted XRD peaks while Fig. 4(e) also displays the experimentally obtained peaks for KNbO3 nanowires at 10K by means of dots’ symbols.